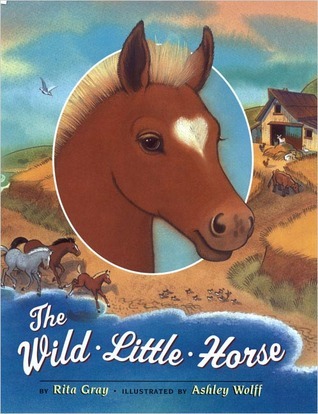 "The Wild Little Horse" by Rita Gray was very animated, and my daughter loved it...she was constantly calling out the different animals contained within the book...it was fun!!! Almost like going to the zoo, or going to the country to visit her grandma...she really gets her full of the cows and horse out there!! !Aside from all the animation, Ms. Gray had a really good message for young readers. In the story, the little horse is constantly trying to break-through with his independence...trying to explore on his own. He has a great time doing it, and he gets a fill of his freedom. However, he soons finds himself getting lonely for his parents, and, when he looks around, he finds them there.As a parent, I believe it's a great lesson for children letting them know that their parents' love with alway be with them, no matter where they are or no matter how big they fill like they're getting. They can't get away from it!! !I give it 5 stars. This was one book whose cover did catch my eye since of the cute little foal's head on the front with a white heart for a blaze. Although I was thinking of a much different story to go along with the title I am just as glad for this particular story that was included within the pages of the book. In very basic prose the reader is taken into the world a coastal farm where very briefly they are introduced to some farm animals before being taken to meet the character of the story. They find out the young horse is happy and excited to since he is given permission by his parents to be able to explore the world just outside of what he knows. Taking the first steps to freedom he drops the farm horse face and becomes a wild horse who splashes in the ocean, runs with the wind and chases after birds. His need to explore and get to know the world around him allows him to be independent enough that he can enjoy the adventure even when he turns around to find that his parents have been with him whether in love or just standing back allowing him to just be him. Definitely a cute story and one that can be read as directed both towards adults and children. The lesson although quite different for each group is just as necessary for both groups to know and to understand we have to be supportive of each other that even when we are loving we are still encouraging each other to be the best that we can be. This has been one of my son's favorite books since he was two years old (he is now eight). He absolutely loves horses now, but he fell in love with the book before he ever even met a real horse.The book is quite long. It's a story, but also a very long poem. I personally love the rhythm of it, and have the entire book memorized (yes, that's how many times we've read it). When he was a toddler/preschooler and we were away from home without the book, I could still "sing" the story to him to help him sleep.The illustrations are great; horses of course, but lots of other animals and scenery as well.I would say it's suitable for toddlers through elementary aged children.My other son (who is five yrs old now) never really got into this book, and my husband didn't like to read it either. So it's probably not for everyone. I think it was really good i like when they say horse with wide eyes *(:(;! I wasn't sure how this one would do in storytime because some of the interactive parts were a little forced. But my kiddos did well with it! This is such a cute book about a baby horse going out of the stable and away from his papa horse and mare horse for the first time. He meets some of the other animals around the farm and then explores all the way down to the sea and splashes around in the ocean. It's a sweet story about exploration, discovering fun new things, and still being able to go back to the safety and comfort of mommy and daddy. I love it and my son does, too. This was a fun book to read. My son loves horses so he really enjoyed it to. This book reminds me of all children wanting to go out on their own just like the little horse. The little horse wanted to go out on adventures and see things for himself and did not want his parents with him. I also like that there are some rhyming words and different word plays. For examples Gallipity - Lip Gallipity-Lop. This makes it easier for children to sound out words or try to read the words them selves. ★★★★★The Wild Little Horse by Rita GrayThis was free through the Dolly Parton Imagination Library Program.A great story about a little horse leaving the barn to explore the world. So this is literally like the 1000th time reading this, and she loves it just as much as she did in '06 when we got it. A simple rhyming story of a little horse going out on his own and running free. The illustrations are pretty and go well with the story of going from playing around the barnyard to running fast and free. I would use this in class to teach about horses, and about gaining independence. A little horse explores its surroundings. Not a fan of this one - it seemed awkward to read aloud.